Selecting the correct "Heat Recovery Steam Generator" (HRSG) for engine cogeneration (CHP) and other industrial waste heat systems involves much consideration. Important areas of focus are controlling/bypassing the exhaust heat, optimizing overall system performance, maintaining required operating pressures, the boiler size, weight and installation. Cain's HRSG families are specifically designed to address these concerns and more with standard design features not found in conventional waste heat boilers. Our equipment will adapt to any retrofit application or new installation. Contact our sales team to receive a comprehensive proposal and quotation engineered to meet your exact requirements (within 48 hours). The Only Heat Recovery Steam Generator in the World to Reach Full Steam from Startup in Less than 10 Minutes! This fully packaged heat recovery steam generator is selected from 124 pre-engineered standard models with output capabilities of 20 to 300 boiler hp and operating steam pressures from 3 to 450 psig. The Cain ESG1 is shipped complete, ready for operating as either a primary or supplementary steam source. 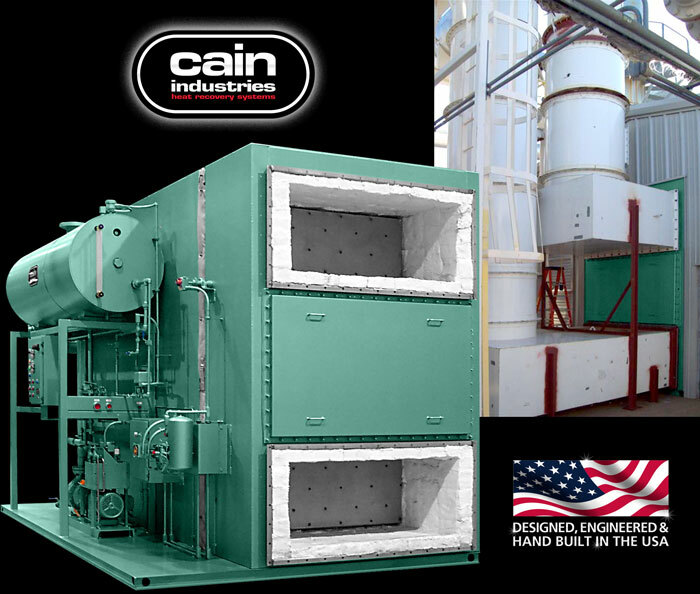 The Cain ESG1 is manufactured, tested, and stamped in accordance with the requirements of Section I of the ASME Boiler and Pressure Vessel Code, and National Board. Boiler trim includes all safety controls and alarms to meet state and federal codes. Final assembly, electrical wiring, and factory adjustments are completed under a strict set of guidelines. This HRSG is an unfired fully automatic, skid mounted packaged steam generator combining a finned tubing heat transfer section, steam flash circulating drum assembly, and full exhaust bypass. Where low or high pressure steam output demand is a necessity, the HRSG in terms of recovered BTU/hr and its use, is a more valuable alternate selection to liquid or air preheat exchangers. The design allows for flexibility in heat transfer (explosion proof) output, lightweight design and compactness for lower installation costs, and will offer the greatest thermal efficiency. 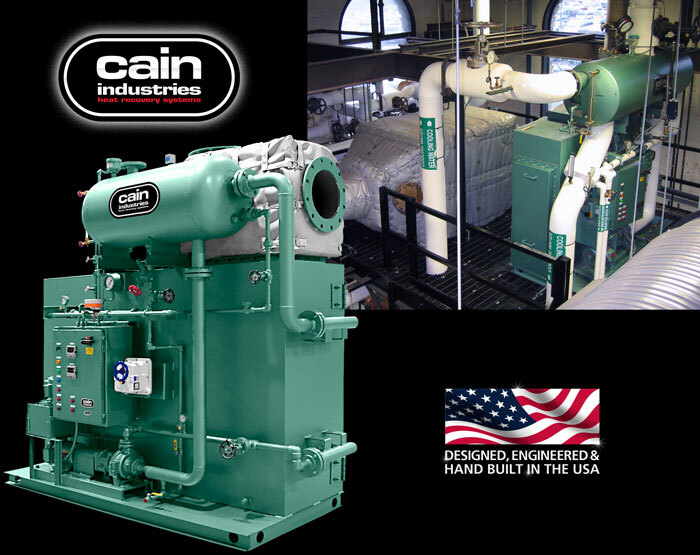 Cain's heat recovery steam generator accommodates outputs from 20 to 500 boiler horsepower with operating steam pressures ranging from 3 to 450 PSIG. Engineering design consideration has been given to complexities and flexibility requirements of steam generation, and retrofitting the engine and fume incineration market. Important areas of concern are: controlling and bypassing waste heat, optimum performance selection, operating pressures, size, weight, and ease of installation. Our HRSG addresses concerns with standard design features important to the designer, packager, and customer which are not usually found in conventional waste heat firetube boilers. The extremely lightweight, compact design includes three basic sections: the fin tube heating surface, steam flash drum assembly, and a modulating full-port exhaust bypass pre-piped and wired for ease of installation and minimal customer connections. The integral circulating pump continually circulates water to the heat transfer section recovering BTU from the exhaust, and back to the steam drum assembly where the water is flashed to steam. Coupled with the HRSG's capacity to produce and control supplemental or primary steam output, it's unique design allows for full output in approximately 10 to 15 minutes and is fully automatic under fluctuating loads. The HRSG is a packaged forced circulation watertube design, manufactured and tested in accordance with the requirements of Section VIII, Division I of the ASME Boiler and Pressure Vessel Code, and stamped to the appropriate section.